OVER 9 MILLION JOURNEYS were made on Irish Rail from January to March 2015. This represents a 3.8% increase on the same period last year. Increases of 2.1% and 2.2% were recorded for Intercity and Commuter respectively, while growth on DART services jumped by 6.1% on the first three months of the previous year. Economic growth, including the ongoing increase in the numbers in employment. 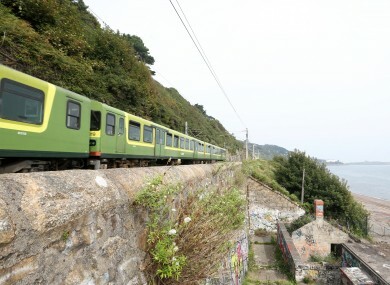 The company has increased capacity on a number of services to meet the growth in demand, and has been operating additional services to supplement Intercity demand, including a new Friday evening service from Dublin to Waterford in recent weeks. Irish Rail said it is working with the National Transport Authority to increase the frequency of DART services in 2016, as growth is forecast to continue. Plans to increase the core frequency of DART services from every 15 minutes to every 10 minutes are already underway. In 2014, there was an increase of 1.1 million journeys (2.9%) on 2013 – to 37.8 million journeys. A spokesperson for Irish Rail said “the continuing and accelerating growth in demand for our services is very welcome for Iarnród Éireann and the wider economy”. We are already looking at continued growth forecasts to ensure we develop our services to meet the growth in demand we are experiencing, with a particular emphasis on increased DART frequency. Email “Good news if you use the DART... There'll soon be more of them”. Feedback on “Good news if you use the DART... There'll soon be more of them”.